Interactive learning allows children to visualize and better understand complicated scientific concepts such as chemical reactions, electricity and the environment. 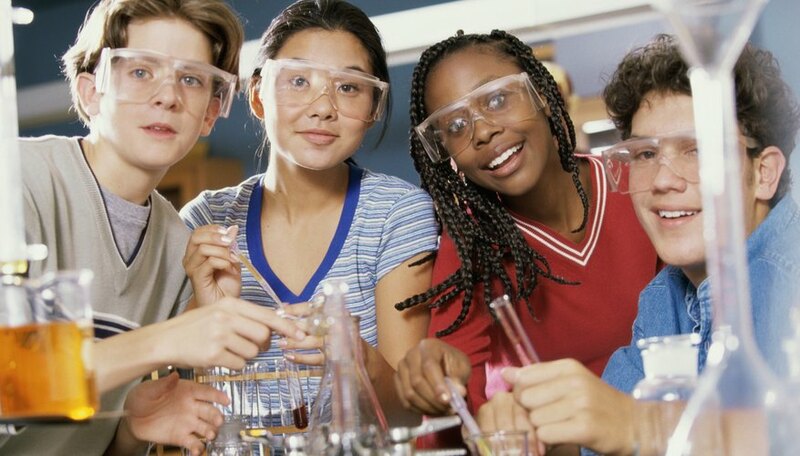 Science improvisation in the classroom illustrates theories and methods in a safe, fast and easy manner using simple experiments and everyday objects. It also allows schools and teachers to save money and time. Chemical reactions are responsible for every function in both your body and your environment. However, as most of these reactions cannot be seen, they may be difficult to explain to students. And the more explosive chemical reactions are dangerous and destructive. Teachers and science experiment kits have improvised by demonstrating chemical reactions with safe, household items. For example, combining baking soda and vinegar produces a reaction that students can see and hear. Explain to students that combining baking soda and vinegar produces water and carbon dioxide, the latter being a gas that is released into the air. The harmful effects of pollution on buildings and other structures act slowly over time but can be seen in most urban areas. Discuss how air pollution due to emissions from factories and vehicles causes acid rain, and show students pictures of damaged buildings and statues. If possible, take them on a walk to see the effects of pollution first-hand. Use safe, household acids such as vinegar and chalk to demonstrate the corrosive effect of acid rain. Explain that acid rain contains sulfur and nitrogen acids, which have the same damaging effect at a slower, but more widespread scale. Additionally, ask the class to discuss ways to prevent air pollution and acid rain and how to implement such changes. Electricity and motors powered the industrial revolution and made society what it is today. Teach students about electricity and mechanical energy by improvising with diagrams, simple experiments and videos. Students can learn about electricity circuits with diagrams and models that use batteries and light bulbs. Demonstrate how changing the battery or increasing the voltage makes a light bulb shine brighter. As the students progress, you can add switches and additional wiring to demonstrate how more complex electrical circuits work. Additionally, teach students about electricity safety measures by demonstrating how some materials, such as wood, will not conduct electricity. Physics is a science subject that students often find very difficult; simple experiments help to make it less complex and demonstrate to students that the laws and concepts of physics are all around them. Ask students to find the frequency, voltage, wattage and other measurements on everyday appliances and items such as light bulbs, microwaves and stoves. Explain what these measurements mean and how they are used in physics formulas, such as calculating the speed of light. Teachers can demonstrate complex physics concepts such as stored energy, gravity and buoyancy with rubber bands, paper boats, feathers, pendulums and other everyday objects.